My grandmother had a window seat in her house on the second floor landing. It overlooked the garden. She used to do her sewing there and watch the squirrels scamper in the hawthorn trees. She could see her neighbour painting the plaster busts of Beethoven and JS Bach she made with the do-it-yourself plaster kits she got from the hobby store. Her other neighbour collected redcurrants in enormous straw baskets like an eighteenth century farmer. She turned them into jam which she gave to people on their birthdays. If I had a window seat I would have lots of cushions – fancy ones with Medieval scenes like they have in the antique shops – and a book case on one side full of my favourites. I would read and watch the world as it rained, counting the drops as they fell on the glass, listening to them land as if fat were popping in a pan. The house would be quiet, except for the rain and the flutter of paper as I turned the pages. That window seat would be safe harbour. It would fill me with such joy to sit and read as the sky drifted in. If I only had a wish….. Sitting on a well-cushioned window seat, looking out at the world and reading whilst it’s raining ouside sounds wonderful. I woud add that the window seat was large enough to nap on. Reading and rain make for great nap-time dreams. I wonder if you ever took part in the Palm Sunday nuclear disarmament ; save the whales, save the rain forests, stop woodchipping rallies of the late seventies, mid-eighties? David – I absolutely agree about having a window seat large enough to nap on. I did take part in a number of rallies in the mid eighties when I was a Uni student. All those issues meant a lot to me then. They still do. Maybe it’s time for another rally! It sounds lovely – maybe one day you’ll have your window seat. I have an armchair next to the window in the lounge – in winter I can curl up there in the sun and read. It’s my favourite spot. Daoine – that armchair sounds like heaven. So cosy. My mum has a big chest under a tiny window on the landing in her cottage under the eaves. There’s hardly any room to move so you have to lie down on it. Its perfect as you have to be still and watch the squirrels and birds. Window seats bring peace, why is that? KATE – so lovely to hear from you. 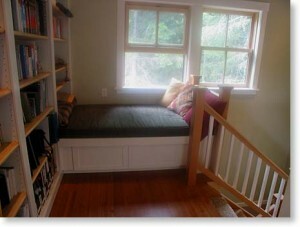 Do you think the landlord would mind if we built a window seat in this house? Probably..sigh. Your Mum’s window seat sounds right up my street. They do bring peace, maybe it’s because they give us a moment to contemplate and focus on our own little corner of the earth. I’m determined to get my own one of these days! Yes, there’s nothing quite like a comfy place and a nice stretch of time to read. There was a wonderful photo exhibit in Washington DC 10 years ago. It featured people of diverse ages and cultures in a comfy corner, reading in solitude. Some were in nooks, some on stairs, on buses, on a park bench, under an awning in the rain. Happy reading to you. I loved having a window seat. I miss mine. I’ve always liked the idea of window seats, but never had one. I do like the looks of the one in the photo. It seems just about perfect, well, maybe just a wee bit longer for me. But what a perfect way to use that space, right? CAROLINE – I would have loved to have seen that exhibit. Right up my street. MELEAH – I’m so sorry you had to say goodbye to your window seat. Hopefully one day both you and I will get one. BONNIE – Welcome. So nice to meet you. It is a perfect way to use the space, I agree. I keep on hoping…..
That sounds like the perfect way to idle away a rainy afternoon. Bliss!